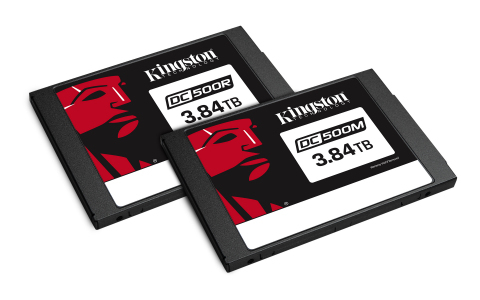 Kingston Digital, Inc., the Flash memory affiliate of Kingston Technology Company, Inc., a world leader in memory products and technology solutions, today announced it is shipping the Data Center DC500M Enterprise SSD optimized for mixed-use workloads. This is the second drive in the DC500 series that implements Kingston's strict Quality of Service (QoS) requirements to ensure predictable random I/O performance as well as predictable low latencies over a wide range of read and write workloads. Last week, the company began shipping its DC500R SSD optimized for read-centric applications. "Eighty (80) percent of all enterprise SSDs deployed in data centers require less than one (1) DWPD," said Gregory Wong, president and principal analyst, Forward Insights. "As data centers seek the optimal balance between application-required endurance, capacity and cost, this trend is expected to continue." "Quality of Service in an enterprise SSD is essential for Cloud computing applications that require predictable storage performance levels and meet customer service level agreements. The new DC500 Series SSDs deliver excellent performance to intensive data center applications from the development stage of the application to the end-user customer experience downstream," said Keith Schimmenti, enterprise SSD business manager, Kingston. "To ensure the security of user data, DC500 incorporates end-to-end data path protection and power-loss protection to safeguard data in-flight in the event of sudden power loss. This is the optimal data center storage solution when you combine its enterprise-class reliability and strict QoS requirements along with Kingston's legendary pre- and post-sales support." Reduce application latencies: Data center's hosting databases and various web-based applications can leverage the predictable I/O and latency performance. 1 Some of the listed capacity on a Flash storage device is used for formatting and other functions and thus is not available for data storage. As such, the actual available capacity for data storage is less than what is listed on the products. For more information, go to Kingston's Flash Guide at kingston.com/flashguide. 7 Limited warranty based on 5 years or SSD "Life Remaining" which can be found using the Kingston SSD Manager (kingston.com/SSDManager). A new, unused product will show a wear indicator value of one hundred (100), whereas a product that has reached its endurance limit of program erase cycles will show a wear indicator value of one (1). See kingston.com/wa for details. Kingston Digital, Inc. ("KDI") is the Flash memory affiliate of Kingston Technology Company, Inc., a world leader in memory products and technology solutions. Established in 2008, KDI is headquartered in Fountain Valley, California, USA. For more information, please call 877-546-4786 or visit www.kingston.com. Editor's Note: For additional information, evaluation units or executive interviews, please contact David Leong, Kingston Digital, Inc. 17600 Newhope Street, Fountain Valley, CA (News - Alert) USA 92708, 714-438-1817 (Voice). Press images can be found in Kingston's press room here. Kingston and the Kingston logo are registered trademarks of Kingston Technology Corporation. IronKey (News - Alert) is a registered trademark of Kingston Digital, Inc. All rights reserved. All trademarks are the property of their respective owners.